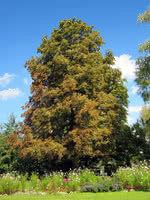 American Elm is fast growing, tall tree with a recognizable and pleasing shape. It's well suited for urban environments because of its non-invasive roots and ability to grow on harsh sites (quite salt tolerant). American Elm develops a wide, dense canopy that provides shade for many city streets around North America.